A men's fragrance inspired by the might of the sea, L'EAU MAJEURE D'ISSEY reinvented Issey Miyake's pioneering aquatic note for the 21st century. 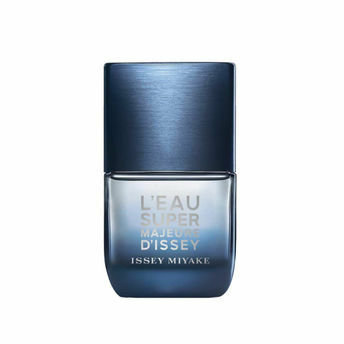 L'EAU SUPER MAJEURE D'ISSEY unleashes the power of water, with a new, exhilarating blend. The bottle is the same bold, vibrant blue as the waves of the sea. Evoking the sophistication of water in an intense, rich fragrance, this fragrance will unlock your infinite possibilities. The top note contains a super-vigorous surge of aromatic clary sage and rosemary notes. The middle note is textured by dark patchouli, vibrant ambery woods and an overdose of cashmeran, with black salt boosting the scent's swirling accords. And smooth tonka bean and black vanilla add a dark leather undertow in the base notes. Explore the entire range of Perfumes (EDT & EDP) available on Nykaa. Shop more Issey Miyake products here.You can browse through the complete world of Issey Miyake Perfumes (EDT & EDP) .Alternatively, you can also find many more products from the Issey Miyake L'Eau Super Majeure D'Issey Eau De Toilette range.